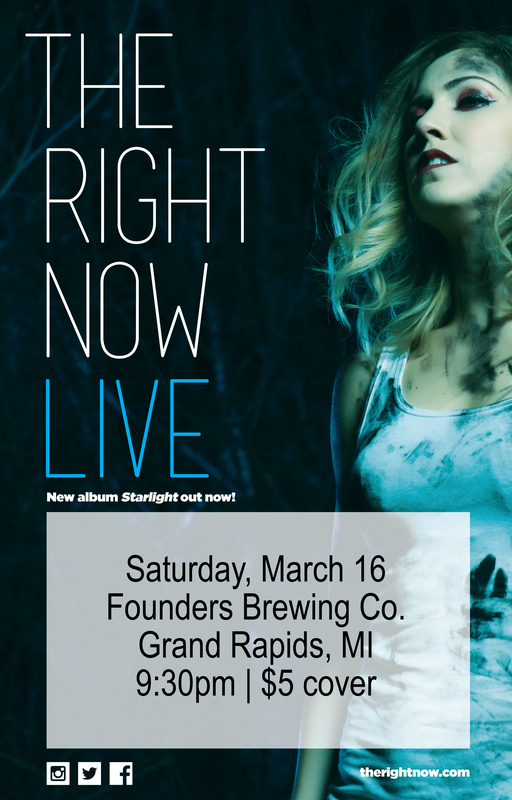 The Right Now - Founders Brewing Co. The Right Now’s pop-meets-soul sound is more than a vehicle for Stefanie Berecz’s captivating voice. The celebration of thoughtful, catchy songwriting and intricate arrangements evokes a subtle sophistication in the tradition of Quincy Jones’ 70s and 80s masterpieces. Since 2008 the band has toured much of the United States and released three acclaimed albums, racking up placements in television, national commercials, and the multi-million-selling video game Watch Dogs. The Right Now’s Chicago roots permeate their music and performances: breezy horn lines sit atop soul grooves old and new, all while Berecz elevates one audience after another with her “classic yet contemporary voice” (Philadelphia Inquirer). College radio stations from Asheville to Seattle put 2012’s Gets Over You on the CMJ charts, and critics nationwide have championed TRN as “the real deal” (Pittsburgh City Paper). The seven-piece band landed an official Record Store Day release in 2012—all 750 copies sold out immediately—and collaborated with New York label Deep&Disco on a remix project. The Right Now has opened for Fitz & The Tantrums, George Clinton & Parliament/Funkadelic, Rebirth Brass Band, Bettye LaVette, Lee Fields, and many others along the way. Starlight hit the streets in February 2017 to critical acclaim. NPR’s Sound Opinions hailed Berecz’s performance as “stronger…than Adele” while others dubbed the songs “insanely infectious and incredibly well crafted” (Tomorrow’s Verse). The Right Now played two sold out headlining shows in Chicago in addition to tour dates all over the Midwest and East Coast. Both on Starlight and in their acclaimed live shows, Berecz and The Right Now confront the darkness of modern times head on, utilizing their music as a beacon to navigate to safer ground. The band continues to tour behind Starlight in 2018.